Slam-Dunking Wal-Mart! is written in two parts. 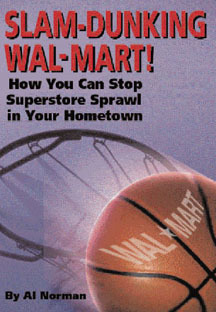 The first part describes why Wal-Mart, Home Depot and their kin are a threat to small community life in America.The second part gives you a game plan to stop Wal-Mart and other big-box retailers in your home town, much the way Al Norman and other concerned citizens kept Wal-Mart out of Greenfield, Massachusetts. The book is a call for the preservation of all the qualities we love about hometown America. It is one man's "David versus Goliath" story. It can also be a road map for your community's fight to keep its downtown businesses and core values. ​​A grassroots activist who has helped countless groups organize efforts to fight the spread of Wal-Marts in their hometowns, Al Norman has been on 60 Minutes and quoted in publications from Fortune to the Wall Street Journal to the New York Times. He posts frequently on his blog, Sprawl-Busters.com, and continues to contribute essays to the Huffington Post. "​Al Norman's book Slam-Dunking Wal-Mart! educates not only citizen groups, but Planning and Zoning Boards across the country. It also assists them in directly dealing with these inevitable imposters to the quietude of rural America. If you can't get Al Norman to come to your town (you might be able to if you contact him), this book is the next best thing." "A one man anti-Wal-Mart cottage industry."